"I've never quite understood, in the Triangle Transit Train Dream, why there wasn't a station planned for East Durham"
Or why no one ever cleans the park bathrooms in black neighborhoods. Yuck. I make it a point to avoid park bathrooms everywhere, so I can't comment on that. But it wouldn't make much sense for it to be a demographic issue, given the siting of a station at Alston Avenue, which, at least back in the 90s when these stations were planned, had similar demographics to Driver St.
My guess would be that there was some avoidance due to the relatively large number of freight sidings between Alston and Briggs - (there are 4 tracks east of Driver and up to 7 tracks west of Driver). I more wonder whether East Durham (at Driver) was seen as a critical enough location to seek a way to overcome those limitations - I'm not confident that planners would have noted the factors that could make a Driver Street station a very important asset for the neighborhood, and one of the potentially most successful at actually spurring economic development. Gary -- when I pushed a TTA official on this in around 2002 or so, I was told that Driver St. sits in the middle of about a mile-long stretch that's basically a rail yard and switching station. (in addition to the Duke Loop, the Joyland and Apex tracks, both active I believe, converge near there.) The logistics involved in having a station there made it like 5x as expensive as any other station. The TTA fellow said that yes, it was a shame, as the land use around there is well suited to a station. They mentioned that they had speced out a stop at Glover Rd., and that the rail-level stuff all worked there, but of course there wasn't any kind of density to justify it. Looking at the map, I'm also reminded that I think Brenntag sitting right there, which is another active rail user, had something to do with it as well. I drive by that building several mornings a week and have long wondered how old the rotting curtains were -- and there they are, in the oldest photos of the storefront. 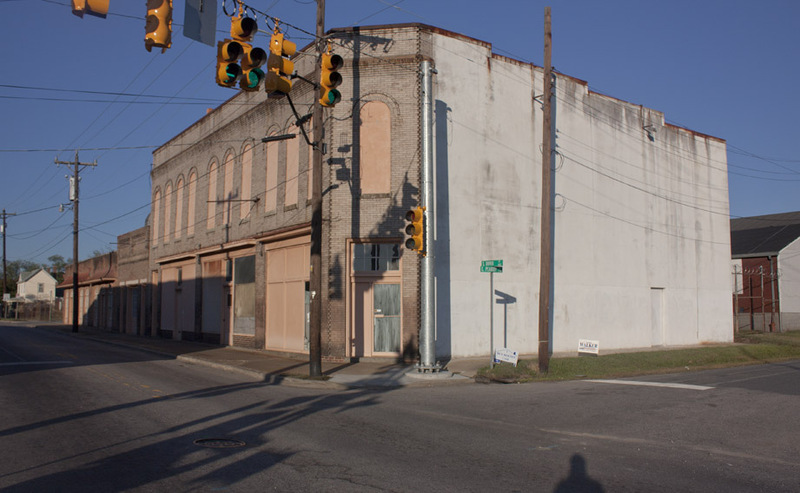 It's a gem of a location for someone to redevelop, a block off of Joe's Diner and the TROSA Grocery. Let's hope. You wouldn't believe how much millwork comes out of this building. The wood trim used to repair the East Durham Graded School (Maureen Joy Charter School) up the street came from Garland. The gavel block for the NC House Chamber was made here and I drove it back and forth until it was hollowed out enough to have the right ring to it in 2002. I have no idea if that block is still in use but the podium in the house chamber still is. 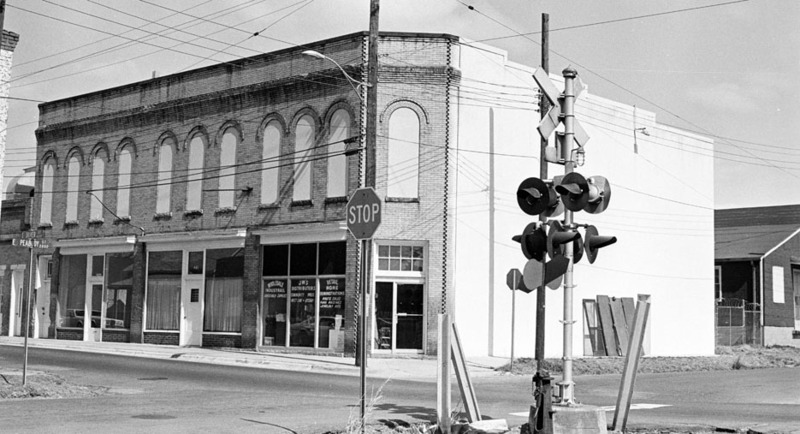 The corner bay (463) was originally home to the People's Bank, and the East Durham Post Office (which had been located in the Durham Cotton Manufacturing Co. building, then in a frame building that this structure supplanted. At 461 was a drugstore, and at 459, a dry goods store. Offices were upstairs, with "Cleaning and Pressing" on the second floor of the 463 bay. 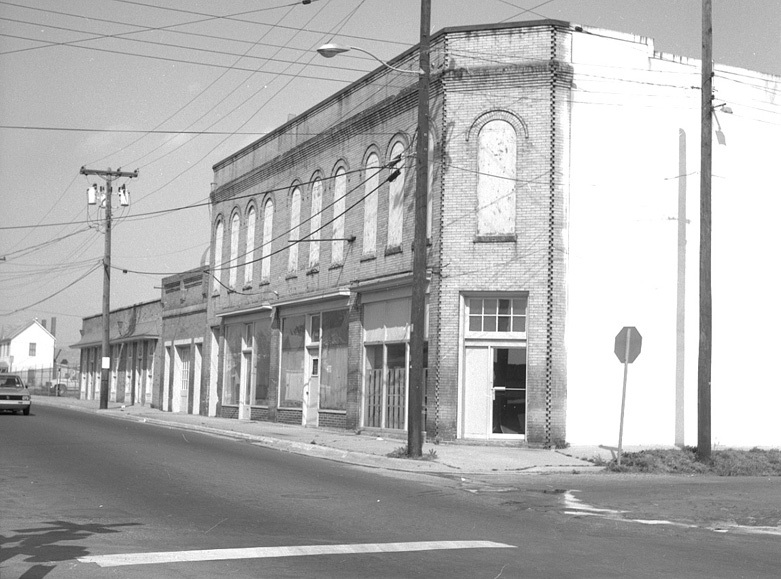 The People's Bank moved to the corner of Angier Avenue and South Driver Street in 1921. By the 1930s, Ferguson Grocery Co. was located at 463, and Royal's Sandwich Shop at 461. In 1944, 459 remained the Salvation Army, 451 was the Stork Supply diaper service, and 463 was vacant. In 1950, 459-463 was the Mission Bottling Company, and the Salvation Army had moved upstairs. 1955, 459-463 was the Cramo Hosiery Mills and Cecil Manufacturing Co. The Salvation Army was still at 459 1/2. In 1960, 459 was the Harris Printery, 461 was Lloyd Electric Motor Service, and 463 the Southern Sales Agency. At some point after 1960, Garland Woodcraft, which had started at 451-453 South Driver, acquired the building. They now own the southern portion of this block - between Salem Street, South Driver St., and East Peabody St. I love this building, although I find the blank southern wall odd, given that I've seen no indication that there was ever a building to the south, and one seems somewhat unlikely given the railroad. I wish I had an old picture of this building with its second floor windows intact, and I wish it again had active storefronts. I've never quite understood, in the Triangle Transit Train Dream, why there wasn't a station planned for East Durham. I don't think any station could have as direct a connection with a neighborhood and neighborhood commercial structures as a station at the foot of South Driver Street could; it's a model 'transit oriented development'. I suppose I should be glad that there wasn't one planned - these buildings might not be here anymore. Prominent, architecturally significant 2-story buff brick building of Classical Revival style, with a double door entrance with transom in the diagonal corner elevation facing the railroad tracks and Peabody St. The 10-bay-wide building has 2 stores with plate glass display windows that are now boarded up. The upper facade contains elegant round-arched windows with drip moldings and a corbeled brick cornice. The rear elevation, of common bond brick, has 4-over-4 sashes in segmental arched windows. Built ca. 1905 as the People's Bank, this was later the Boone Drug Company, with a post office branch in the rear. 1930 CD: King & Mathes Drugs at No. 461. 1935: Royal's Sandwich Shop at No. 461. 1955 CD: Cramo Hosiery Mills at No. 459-463. The Salvation Army Boys Club was upstairs at No. 459. In the later 20th century it was acquired by Garland Woodcraft Company, who now uses it for prefinishing woodwork.